arpReach helps to build your business. On autopilot. arpReach has a huge number of features, all designed to maximize your website's earning potential. And it covers the basics really well too. So if you need an autoresponder and mailing list solution that will cope as your business grows, then arpReach is the right choice. It's very easy to get started with our professional installation service. arpReach allows you to create and run an unlimited number of follow-up autoresponders for one or more websites. Unlike some systems, there are no additional charges for adding extra autoresponders when you need to expand your marketing activity. Each of your autoresponders can have an unlimited number of follow-up messages. Create any number of follow-up autoresponders for any number of websites, each with unlimited follow-up messages. 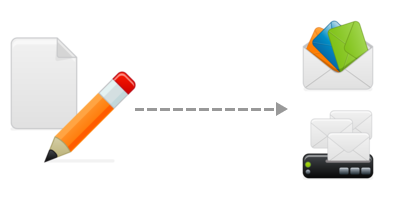 Autoresponders can be grouped for easy management of related autoresponders. Choose on a per-autoresponder basis whether contacts need to confirm subscriptions. For example, existing customers may not need to confirm whilst pay-per-click traffic does to ensure quality. Automatically drop an autoresponder subscription when a contact subscribes to another. For example, move a contact from "prospects" to "customers" after they have purchased. Easily control the format of an autoresponder's follow-up messages by using common headers and footers that you manage in one place. This means you can focus on the content of each message without worrying about its layout. Set these globally or have different custom pages for each autoresponder or even every subscription form. Unsubscribe by clicking one link or present a screen where your contact can manage all their subscriptions. Create enticing "exit" offers or remind customers of paid subscriptions that they will no longer receive content, giving them the option to re-subscribe. Use these to remind contacts to check their inbox for their confirmation email and to suggest they add your email address to their whitelist or address book. Add any number of local (eg Sendmail, SMTP) or remote SMTP delivery providers. For example, use your local server for transactional emails and an expert delivery provider for your free e-course. Test them against each other and choose the best performer to continually drive up your delivery and performance results. Send subscribe/unsubscribe notices to as many people as you want. Include the contact's details so customer support staff can contact them directly. 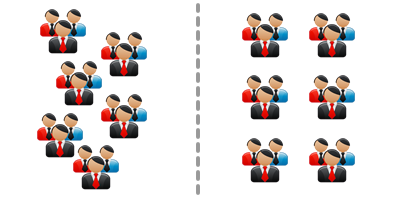 You choose what happens when a contact reaches the end of an autoresponder's follow-up sequence. Move them to a new autoresponder or send them repeat messages from the same sequence. Or leave them active so they receive future message you add. Or maybe just segment them for targeting with broadcasts. You have full control over what happens. Create any number of sending personalities for different people or departments in your organization. Create different personas for the websites you manage to help build your separate brands. 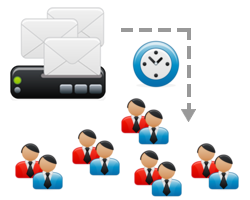 Tiny images that show how many people are subscribed to an autoresponder. These provide social proof to prospective subscribers. 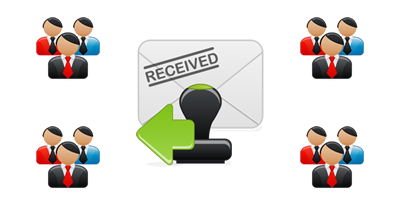 Intelligent resending of follow-up messages that soft-bounced (eg mailbox full) to ensure maximum retention and delivery even when a contact's mailbox is temporarily unavailable. Send any number of "one off" broadcasts such as newsletters, ezines and time-limited offers. Broadcasts do not interfere with scheduled follow-ups. Schedule broadcasts in advance and they'll be sent automatically. Schedule and send any number of broadcasts without per-broadcast or per-message charges. Great for newsletters, ezines and offers. Send as many broadcasts as you want without interfering with scheduled follow-up messages which continue as normal. Broadcasts can be scheduled in advance by date and time (any timezone) for automatic sending even when you are offline. Your computer does not even need to be switched on. It's easy to clone and edit previous broadcasts meaning there is no need to re-create similar broadcasts from scratch. Great for regular newsletters where only the content changes. All previous broadcasts are saved for later viewing, performance analysis or cloning. Segment your campaigns on unlimited fields, including custom fields. Segment by individual or multiple fields for maximum personalization. Include or exclude autoresponders, customer lists, subscription date, link-clicks (or not clicked), message opened (or not opened). There truly are endless possibilities for segmentation because you can set any number of "include" or "exclude" criteria per segment. A simple checkbox system allows you to include (or exclude) one or more lists from a broadcast. Track open rates for each campaign you run to test the effectiveness of your subject lines. The ability to save drafts allows you to start working on a campaign, save it, then come back later to complete it. Great for proof-reading and quality control. Schedule broadcasts in advance for an entire week, month or longer. Set a specific date and the start time for each campaign. Great for automating time-sensitive reminders for events such as webinars and teleseminars. Create different versions of your campaigns that will automatically be rotated, allowing you to test open rates, click-through rates and overall success. Preview the plain text and HTML versions of your messages so you can see how they look before sending. Send yourself test versions of the plain text and HTML versions of your messages to test layout prior to sending. Create and store as many plain text and HTML templates as you need to ensure consistency of campaigns such as weekly newsletters. Plain text and HTML campaigns are scored separately for spam content to ensure both content and formatting issues are caught prior to sending. Automatically post your campaigns to social networks such as Twitter, Facebook and LinkedIn for maximum social propagation. Choose to send a campaign in plain text, HTML or multi-part. The contact' email software will then display the best version for the device. Fully featured what-you-see-is-what-you-get HTML editor for creating stunning HTML campaigns. Or use your favorite HTML editor and simply paste in the HTML. Everything in arpReach centers around the contact and their list memberships. Each contact can be in one or more lists without any duplication of contact data. Contact categories, custom fields (as many as you like), advanced segmentation and action (or inaction) tracking make it a breeze to run laser-focused campaigns. View a complete message history for each contact to see which messages they have been sent and when. Assign any number of custom fields to contacts and segment them in any way imaginable. For example, select contacts who own a holiday home in Florida, who are retired and who opened your previous 2 newsletters. The possibilities are literally endless. Create segments with any number of criteria including standard fields, custom fields, subscription data, list membership, contact category, message opens (or non opens), link clicks (or non clicks) and more. For example, at the beginning of every month, select contacts who joined last month but who have not yet bought a product. Easy-to-use contact edit interface. arpReach is a contact management system as well as an email marketing application. Store any number of fields and unlimited notes for every contact. Quickly search for contacts by ISP or company (if it's in their email address) by typing a few characters and selecting the contact you want from the presented list. You never need to worry that a broadcast campaign sends multiple messages to the same contact because an email address can exist only once in the contact database. Each contact can have subscriptions to any number of autoresponders. This does not create duplicate contact records as the subscriptions are all tied to a single contact record. Just paste in a list of email addresses and click a button. Import contacts from another email provider, text files or spreadsheets. Export your data to make regular backups of your valuable data. Unlike many providers, you get to choose if and when contacts need to confirm their subscriptions. Even when importing, you can choose if those contacts need to re-confirm their subscription or not. Use tracking tags in your subscription forms to keep tabs on which forms are most successful at attracting subscriptions. A custom email address for each autoresponder allows you to collect subscriptions from people who send a blank email to that address. Great during webinars and teleseminars for delivering content to attendees who simply email your special address there and then. And, of course, they are added to your contact database. Each contact can be a member of one or more categories. For example, create a category for prospects and another for customers. You can easily target one or more categories with broadcast campaigns. Choose from dozens of tags that personalize your messages or create your own to increase response rate. These work like "merge" fields in word processors. You can even include all your custom field information by inserting simple tags in your messages. Increase retention, reduce spam complaints and increase the overall effectiveness of your campaigns. And you choose if they need to confirm their subscription or not. Add contacts one by one, paste in a bunch of addresses or do a full import from a file of contact data. Add contacts and subscribe/unsubscribe them to autoresponders from other software using simple http POST requests (eg Curl in PHP). For maximum response and ROI, your email campaigns need to target the individual. You need to send your contacts what they want, when they want it. Tag your contacts interests, wants, and desires and send them timely (even instant) content that is perfectly matched to their expectations. Create as many tags as you need to micro-segment your entire list into segments of one or more contacts. Send each individual contact exactly what they want based on the actual needs, wants and desires they have expressed when interacting with your content. Not just "what", but "when"
Send highly targeted content at the precise moment a contact expresses interest in it and follow up automatically in days and weeks ahead. Segments based on tags can have just one contact, ensuring your content is matched with absolute perfection to the individual. Have you got just one contact with a tag in a list of thousands? Just one click pulls them out. arpReach reacts instantly and silently when a contact does something that you want them to do. These contact "events" are tied to any number of "actions" that can happen immediately such as sending an email, moving the contact into a follow-up sequence or tagging their interest for future targeting. By immediately responding when a contact acts, such as filling out a form, clicking a link or opening a campaign, you can give each and every contact exactly what they want at the precise moment they expressed interest. One-size-fits-all marketing is a thing of the past with arpReach. In this highly competitive world, you need to be ready and waiting to act immediately on a prospect's expression of interest. arpReach manages it for you instantly and silently on autopilot. arpReach monitors what contacts are doing and is ready to act as soon as an "event" (or trigger) happens. Form submissions, link clicks, broadcast opens, follow-up message opens are all monitored in real time. A single event can trigger as many actions as you want. Your contact clicks a link and you (1) tag them, (2) send them the information they requested and (3) add them to a targeted follow-up sequence. And all they did was click one link. Add/remove tags, add/remove contact categories, add/remove autoresponder subscriptions, send a personalized one-off email, change the contact's standard or custom field data, post the contact via HTTP to another script, add/remove from suppression or ban list, delete contact, run a user-defined function. Standard and custom field data can be altered in real time as soon as an event occurs. A contact tells you their shoe size? Log it in their record, instantly and automatically. Send the contact record to other software whenever an event is triggered. Run a user defined function to change data in arpReach or a separate software system. The contact record is sent to your function. arpReach has many tools to ensure the creative design process is as easy as possible with duplicate effort eliminated. Features such as the template library, attachment library, custom field manager, central link management make this possible. Create and store any number of plain text and HTML templates for use as the basis for follow-up messages and broadcast campaigns. One click pulls a template into a new message. Manage all your file attachments in one place. If you need to change a file, simply upload the new version and the change will automatically be applied to all the follow-up messages and scheduled broadcast campaigns that use it. Create unlimited variables to add variable content to your message such as prices, discounts and offers. Change the content in one place and it is automatically changed in all your messages. Create and save plain text and HTML ads for repeated use. These are great if you sell ad space in your newsletter or ezine or promote your own products in your messages. Create, manage and analyze all your link tracking in one place. 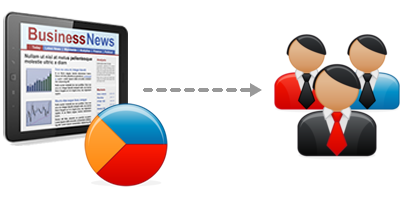 Segment your campaigns based on contacts who clicked (or did not click) your links. Drive Up Your Delivery Rate. arpReach manages the delivery issue different from other providers, putting you in control. Manage it inhouse or outsource it to any number of delivery experts such as SendGrid, SMTP.com or Amazon SES. Pitch them against each other and pick the best. Rinse and repeat to drive your delivery rate up. Add any number of local (Sendmail/SMTP) or 3rd party (SMTP) delivery providers. Use your webhost's email server or outsource for the best of all worlds, with you in complete control. Every follow-up and broadcast campaign can have its own delivery provider. Test your delivery providers against each other and keep the best. Repeat the process to continuously drive up your delivery rate. Create unlimited custom email headers to stay compliant with the latest requirements of the major ISPs. Check your plain text and HTML emails separately against the Spam Assassin database to ensure the lowest possible score for both content and format. 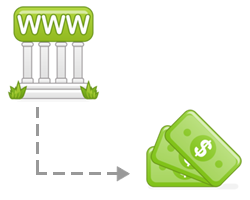 Automatic suppression prevents sending to specific addresses or entire domains. Add people who have complained or serial refunders. Ban individual addresses or entire domains from signing up to your lists to help minimize spam traps, honeypots and subscriptions robots. Manages hard and soft bounces differently to keep your mailing list clean while automatically retrying contacts that have temporary inbox issues (eg mailbox full). Contacts can self-manage their subscriptions to ensure they remain only on the lists they want to receive information from. They can add themselves to your do-not-contact list to ensure you can't inadvertently email them again. arpReach gives you the freedom to design the way you want. Create great looking plain text and HTML emails right within the software using What-You-See-Is-What-You-Get tools. Or simply copy and paste content from your current favourite editing software applications. Got a favorite template? arpReach is compatible with EVERY plain text or HTML email template. Create unlimited plain text and HTML templates to use for your follow-up and broadcast campaigns. arpReach can use any email template. Search online for an unlimited supply of innovative designs. If you already have plain text and HTML editing software, use those and paste the copy into arpReach with no new design learning curve. Use the built-in What-You-See-Is-What-You-Get HTML editor to create and edit your email campaigns. Add tables, create links, insert images and format text right within the software and see the results as you work. Preview the plain text and HTML versions of your messages before sending them to see exactly how they will appear to your contacts. Send yourself test copies of your campaigns so you can check your campaigns as they appear in your email inbox. Earn generous commissions by promoting arpReach to your website visitors, newsletter subscribers or social network followers. We'll add $20 to your affiliate account just for signing up and pay 25% for every sale you generate. And if you're an arpReach user, the software can even promote your affiliate link on autopilot to your contacts and subscribers. Sign up today and we will start your account off with a $20 bonus. Visitors you send us are tracked for a full year.